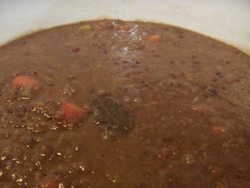 On the day after Thanksgiving, my mother would always put the turkey frame up to boil with lentils and aromatic vegetables to make her very simple and delicious turkey lentil soup. For years I ate this good soup the week after Thanksgiving, usually with crisply broiled Kosher frankfurters (for their beefy, garlicky flavor, rather than for any reasons of observance) on rye bread. The coming of age allows us the freedom to experiment, branch out and move away from our family traditions or at least play with different versions of them, exploring the exotic, coming to know for ourselves what we like. Although I always make soup of some kind or another, most of my adult life I've made any and all kinds of turkey soup -- other than turkey lentil, that is -- on the day after Thanksgiving. I've made turkey vegetable, turkey rice and turkey barley, as well as other variations too numerous to list and too far away in time to remember. And it's not that I don't make lentil soup -- I make lentil soups all the time. Sometimes I make a Spanish lentil soup with chorizo and spinach. Then there's the mulligatawny, made with red lentils and coconut milk. I love to make aromatic Moroccan harira with lamb and chickpeas as well as lentils; or there's a vegetarian lentil that I'm fond of, scented with cumin and copious quantities of garlic and mint. But it's been a very long time since I made my mother's turkey lentil soup. This is the time of year when my own particular brand of seasonal affective disorder sets in. I spend some time dwelling in the past, and sometimes I seem to get stuck there, at least for a bit. I'm nostalgic for the way things were, in what seems like the long ago and far away. I'm no longer a child, anticipating the holidays. We grow up, we grow older, we lose people we love. Those we're close to get married, and start spending their holidays in other family circles. Friends move to other parts of the country or become estranged; beloved elders die. A good part of yesterday and a fair portion of today were laced with these broody, melancholic moments. But each time I was ready to sink under the weight of my own thoughts, strong arms wrapped themselves around me and G said, simply, "I'm here." That was all I needed in order to remember that indeed, I have a lot for which to be truly thankful. And so suddenly I knew how to live inside some of my sorrow, the grief that never really goes away. It seemed time, today, to come full circle, and invoke the spirit of my mother, five years gone, by making her traditional post-Thanksgiving soup. I didn't even have to leave the house -- everything I needed was right here. It was clearly meant to be. The soup is now made, and waiting in the refrigerator for tomorrow's dinner, to be eaten with crisply grilled Kosher frankfurters and rye bread. I've changed just a couple things -- I tend to make the stock from the frame first, and then make the soup on that. And I add leeks, and some shallots too. But it's more or less the same recipe and really, the soup tastes almost exactly like hers, enough that it will bring her into the room with us as we eat it. Strong arms are wrapped around me as we make plans for the holiday traditions we've begun to evolve over the past few years -- Christmas Eve with my favorite cousin and her family; Christmas breakfast with my father; Christmas dinner and a movie, perhaps, with dear pals Nathalie and Josh. New Year's Eve will be à deux, as has always been our custom together, and maybe this year we'll host a New Year's Day fest. Making plans always cheers me up. 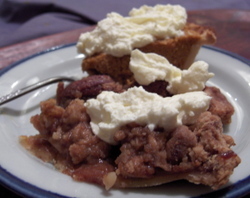 And really, how sad can I be when I'm eating leftover pumpkin soufflé, maple pecan and caramel apple crumble pies, all topped with homemade cognac-scented whipped cream? with all the other soup ingredients. Boil gently until lentils are very tender and partially dissolving into the soup, at least 45 minutes, but perhaps as much as an hour and a half.. Give an immersion blender a quick spin through one corner of your soup to thicken it up a bit. Don't puree it all -- you want the lovely texture of the lentils and vegetables, too. Add the picked turkey meat back into the soup. Taste, and adjust seasoning. Serve with grilled frankfurters -- or maybe just some good bread and cheese and a salad. It sounds as though the memories of traditions past and the memories you are creating today, give you no reason to be sad! *virtual hugs* It never gets easier, does it? My father's been gone for just over 6 years now. It's funny though, it's also food (mostly scents or tastes) that will jar memories to the surface and make me remember a lot of things that otherwise would remain in the dregs of my memory. I'll have to remember to keep the turkey frame when I make turkey next month. Thanks for sharing. Tim, thanks for visiting. So true -- although we all have may have reasons to be sad, it certainly helps to remember all the reasons we have for rejoicing as well. Bro, there's a container of turkey-lentil waiting for you in the freezer. Glad you've been enjoying the pies. i like this part of the blog: "Sometimes I make a Spanish lentil soup with chorizo and spinach. Then there's the mulligatawny, made with red lentils and coconut milk. I love to make aromatic Moroccan harira with lamb and chickpeas as well as lentils; or there's a vegetarian lentil that I'm fond of, scented with cumin and copious quantities of garlic and mint. But it's been a very long time since I made my mother's turkey lentil soup." What a timing of this article, I was just about to buy Christmas gifts for my three darling children. I would ensure to keep all the tips in mind when buying them Christmas gifts. I read more tips on the topic over. You can read as well. The perfect soup for day after thanksgiving!! In my family, We used to make a kind of cream with the turkey frame. i know everything that comes ot with lentils would be good so i can feel that nice flavour they have i really like this i doing it because idone twith chicken and is as nice but trukey,mmm i cant wait. What a delicious recipe!! I wonder if you have more like this. Thank you so much for sharing this post.Your views truly open my mind. Very intersting point of view that at the same time generates differents others opinions on this topic your blog has been very helpful. I like your article so that I read all of your articles in a day.Please continue and keep on writing excellent posts.